The Sant’Agnese monastery on the Via Nomentana is one of the oldest in Rome, founded and endowed by the daughter of Emperor Constantine, according to the tradition recorded in the Liber Pontificalis. The documents relating to the history of the monastery are kept in the archives of San Pietro in Vincoli and have been published by I. Lori Sanfilippo [Il monastero di S, Agnese sulla via Nomentana. 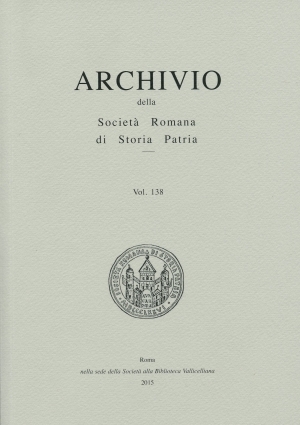 Storia e documenti (982-1299), Roma 2015 (Codice diplomatico di Roma e della regione romana, 8)]. Among the parchments there are two inventories: the first (1268), which concern the vineyards of the monastery located between the Salaria and the Nomentana consular roads, is published in the cited volume on p. 211-224; the second (1331) is about the vineyards, orchards and uncultivated lands in the same area and the rent the tenants were required to pay. The current paper publishes the 14th century inventory and tries – through comparison with the 13th century inventory and other published documents – to extend the research on the income from the monastery’s estates, on the social structure of tenants and the persistence of a number of families on monastery property. The church of S. Bernardo, now known as SS. Nome di Maria alla Colonna, was built at the wishes of the Roman priest Francesco dei Foschi de Berta († 1468) on land he owned near Trajan’s Column. The church was also the seat of a religious community which he established: the Congregation of St. Bernard, a pious association open to both men and women from any social class. The document approving the Rule of the Congregation (1440) and the Will of Francesco dei Foschi de Berta (1451) are published in the appendix to this article. The article recounts the various attempts by the Society of Jesus, starting in the late XVI century, to found a College in the town of Rieti. There are various reasons why the college was never established: in particular, opposition from the clergy of the Cathedral Chapter and the lack of an income sufficient to set up, maintain and run the college. The article reconstructs the stages by which the Carmelites of the Ancient Observance settled in the town of Velletri, from 1573 onward. The Carmelites were granted the church of S. Antonino, formerly the property of the Brotherhood of Mercy which had been founded in the early XVI century with responsibility for burying those condemned to death. Recent restoration of the former Carmelite Monastery in Velletri has brought to light 41 frescoes executed between 1637 and the end of the XVIII century. The decorated majolica currently held in the Vatican Museums goes back to 1651. The history of the collection is long – over 200 years – and also concerns Rome’s principal galleries and most important museums. The events recounted in this article involved the best-known late XIX century antiquarians and art dealers. The notoriety of the majolica collection reached its height in 1879, when the decision to sell it was taken. The sale sparked a serious scandal and the controversy became part of the conflict between Church and State following the Unification of Italy.